The V60HD is ideal for a variety of live event production and streaming applications. Live event production and streaming continues to grow and the demand for more features requires a sophisticated feature set. The V-60HD simplifies your set-ups and combines the best of both worlds that includes SDI inputs for camera sources and scaled HDMI inputs for data, computer, tablet and other video sources. The combination of powerful audio features that include multi-channel embedded audio, XLR and RCA analog inputs, de-embedded audio from digital SDI or HDMI sources plus a variety of video connections with a Program and Aux Bus makes the V-60HD ideal for a variety of live event production and streaming applications. Corporate event production is the fastest growing live event space with companies hosting town halls, meetings, trainings, new product announcements, both in person and streaming. The V-60HD is portable and small enough to be used in multiple locations in an office or outside meeting location. The four SDI inputs and two HDMI inputs are perfect for switching cameras and computers at the same time for dynamic presentations. Not all cameras support full 1080p so the de-interlacer on the SDI inputs allows allows you to mix and match 1080i and 1080p SDI video sources multiple camera without external converters. Audio is easier to mix than ever before using the V-60HD’s auto mixing function that will automatically balance audio levels from multiple microphones and video sources freeing up the operator to focus on switching the video for the event. Video communication helps improve the effectiveness of education when used for streaming lectures, assemblies, distance learning, sports, live performances or theater productions. Multi destination outputs include Program, Preview and AUX buses and make it easy to send the main output to the primary screen or live stream and presenter notes to a presenter’s monitor. Audio auto-mixing automatically adjusts audio level based on weighting ensuring even levels for the room mix, presenter to send to recording, live stream or in-room speakers. Educators can use the multi-channel audio embed function to record 8 discreet audio channels to an SDI video recorder to fix audio issues in later editing or separate multi-language audio sources post event. 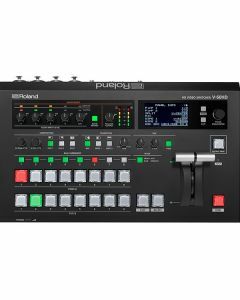 The V-60HD’s user interface is easy for students, novices and can be controlled remotely through the LAN port using Roland’s Remote-Control Software from PC or Mac. For fixed installations, the V-60HD can be remotely controlled through the RS-232 port using touch panel interfaces making it easy to control functions. The V-60HD is ideal for multiscreen environments usually found in churches, conference centers, hotels, and trade show facilities where different content needs to be switched to independent screens. A newly designed wireless tally system for iOS and Android devices makes for smoother events by providing tally that helps talent and camera operators identify which camera is current selected for program and which camera will be switched to next. Integrated audio inputs and advanced effects including Auto-Mixing and powerful dynamics make the V-60HD an ideal streaming mixer solution to remix stems from an audio console and adjusted for broadcast. Cut, Mix with cross dissolve and NAM, FAM transitions. Use up to 30 different wipe patterns. Time based corrected and frame synched provides seamless transitions between 6 video sources and 2 still images instead of buses. Professional broadcast cross point buttons with PGM/PST LED color indicators. Rugged T-Bar, DSK quick edit knobs for key level and gain. Two dedicated PinP and Split buttons with knobs for center framing of Split and PinP placement. Change transition type using either mix or two preset wipe buttons with dedicated transition dissolve time knob. Front panel 3-inch LCD display with quick access menu navigation to adjust switcher parameters. A dedicated AUX bus can be assigned to any of the four discreet SDI or HDMI outputs providing seamless switching from the 8-input channels (4 SDI, 2 HDMI or 1 RGB and 2 Still Images). Dedicated AUX layer cross-point buttons ensures quick operation and seamless switching. The V-60HD features an 18-channel audio mixer which includes four XLR/TRS Combo jacks with 48v phantom power, RCA stereo Pair, plus audio de-embed from the six video inputs. The V-60HD powerful preamp and dynamics effects include a high-pass filter, gate, compressor, 3-band EQ, delay and ability to select audio follows video channel so audio passes through when a specific video source is selected. Dynamics can be adjusted from the onscreen menu or accessed through the powerful Remote-Control Software for Windows or Mac. The included Auto-Mixing function ensures the correct mix for multiple panel participants at conferences by automatically adjusting levels across multiple audio sources. A priority weighting assignment that is channel specific can be set giving the moderator or priority audio channel a higher volume level while using the Auto-Mixing function allowing the operator to focus on video switching and production. Assign up to eight analog audio inputs a separate audio embed channel on SDI 1 and 2 outputs to ensure a separate mix pre-effect (dry) or post effect (wet) for correcting audio problems post live event. This feature is additionally useful for multi-language events to record the voice-over or language translation on its own audio channel to a separate master. An easy-to-use software application V-60HD RCS for Mac or PC provides setup and control information for the Roland V-60HD through a network port. Copy, store and recall memory (backup) and preset settings. The free RCS application is expected to release early Q2 2018. The V-60HD is equipped with an RS-232 port for control and operation remotely from a touch panel or other programmable interface device. * It can be stored up to 2 files in the internal memory.